The ‘demographic winter’ threatens to extinguish European civilisation, but at last it seems that the gravity of the situation is beginning to get through to even sections of the political elite – in Italy at least. On present trends – which are already virtually irreversible – the population of Italy will fall nearly 90% by the end of this century. With immigrants flooding in and having far more children, the stage is set for the ‘white (i.e. bloodless) genocide of the Italians in their own country. 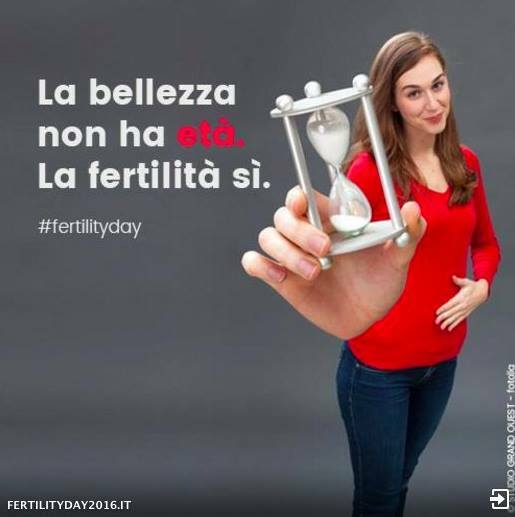 The government has begun to wake up – enough to declare a #FertilityDay and issue some posters, such as this one, reading “Beauty has no age, fertility does”. Predictably, the UK left (notably the BBC and Independent) have attacked the campaign, gleefully quoting the gaggle of Marxists and feminists who took to Italian social media to whine about the initiative and to agitate for the continued extinction of the people who fund their various parasitic non-jobs. In the real world, the campaign is of course to be applauded. Sadly, it will take much more than 12 clever posters to save Italy and Europe. Massive grants for young indigenous families to have children, the reversion of Islamic and African immigration, heavy taxes on childless adults, the suppression of all propaganda seeking to ‘normalise’ homosexuality, the reversal of globalism in favour of running the economy for the benefit of real people rather than the banks – these and many other steps unsaleable in in a democratic, capitalist society are what it would take to keep Europe European. It might happen in Hungary and Poland, but not in Western Europe. The new Dark Ages are coming, and the only thing to do is to evacuate young people who want children and a future from the countries which are already lost, and move to the lifeboat nations of central Europe.